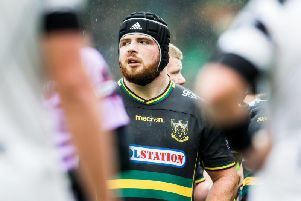 Saints will be able to spend an extra £1million on wages next season after Premiership Rugby confirmed a salary cap rise. The current £5.5million base level limit will increase to £6.5million for the new campaign, with that figure rising to £7million for 2017/18. Premiership Rugby hope that the increase will give English clubs more financial firepower to compete in European competitions. France’s Top 14 teams have dominated in recent years, with Toulon having won the past three European Cup competitions. Premiership rugby chief executive Mark McCafferty said: “The clubs intend to ensure that the English game thrives at club and country level and that we achieve domestic, European and international success. “The financial performance of Premiership Rugby and its clubs, including new commercial contracts with key partners, has helped facilitate plans for the further strengthening of playing squads, including the continued investment in the growth of English talent. Each club will be allowed to continue having a maximum of two players will will be excluded from salary cap arrangements, with one player being new to Premiership rugby or not having played in Premiership rugby for at least 12 months. There is to also be a new England Senior EPS (elite player squad) or international player credit in addition to the base salary cap level to facilitate squad-strengthening, particularly to cover for player absence during international periods. Where a club is unable to select a player in its squad for a Premiership or European fixture as a result of that player being selected in a match day squad by his national union. there will be a total allowance up to £80,000 per player, depending on meeting certain qualification and selection criteria. Meanwhile, Premiership Rugby has confirmed that “certain issues” were pursued with some Aviva Premiership clubs last season in relation to the salary cap. Speculation raged that at least three Premiership clubs might have broken last season’s salary cap limit of just under £5million. But Premiership Rugby said in a statement on Thursday: “Over the last few months, there has been speculation, much of it significantly inaccurate, concerning investigations into clubs. “During that time, Premiership Rugby has not commented in view of the confidentiality obligations in the Regulations. “Premiership Rugby can confirm that certain issues were pursued last season with some clubs relating to access to information, and to commercial contracts where there were differences of opinion as to the correct inclusion or not in the salary cap spend. “The issues were not straightforward and were subject to differing legal opinion and consequent risk as to any judgment on the correct interpretation.